Men's Hockey Takes One of Two in Battle of Comm Ave | BANG. The 279th meeting between Boston College (4-6-2) and Boston University (4-7-2) men’s hockey programs lived up to the hype yet again. BC took game one at Agganis Arena on Friday night with a 4-1 win over the Terriers, then tied on Saturday night with a 0-0 draw in a goaltenders' duel in Chestnut Hill. In the first game of the series, the Terriers came out of the gates aggressive. Agganis Arena rocking with electricity, BU rode that energy to maintain puck possession for a majority of the first period. The Eagles, on the other hand, didn’t look ready for the BU attack. Two minutes into the game, the Eagles were already down a man after Jack McBain received a five-minute major and game misconduct for contacting the head of BU’s star freshman Joel Farabee. However, BC ranks in the top 20 in the NCAA with a .841 penalty kill percentage, and they continued that dominance by killing off the major. After outplaying the Eagles to this point, the Terriers broke through first on their next power play with Chad Krys' third goal of the season midway through the first period. All momentum was with BU and BC looked for a spark to ignite their offense heading into the locker room for the first intermission. In the second period, BC came out stronger on the forecheck with some fantastic opportunities to tie the game. Boston College’s Aapeli Räsänen almost put the Eagles on the board thanks to a turnover by Boston University goalie Jake Oettinger in their own zone. Casey Fitzgerald also had two great chances on back-to-back offensive possessions, the net wide-open both times, but was not able to capitalize on either chance. 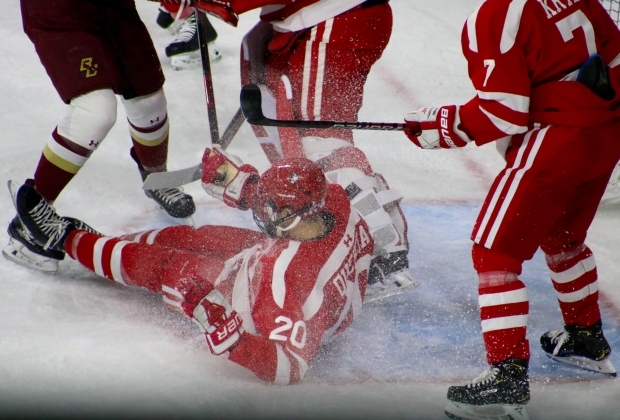 Midway through the second, BC’s Logan Hutsko took a pass from Julius Mattila after the faceoff win and snapped a shot into the back of the net that squeaked by Oettinger’s pads. BU had a couple of great opportunities to tie the game, but phenomenal saves by BC goaltender Joseph Woll kept the game knotted at one. Another crucial draw by Mattila in the Terriers' zone and a great feed by David Cotton set Hutsko up again as he capitalized once more with a snipe just over Oettinger’s glove. Coming into the game, Hutsko was in the midst of a career-best six-game point streak and had either scored or assisted the past 16 goals. 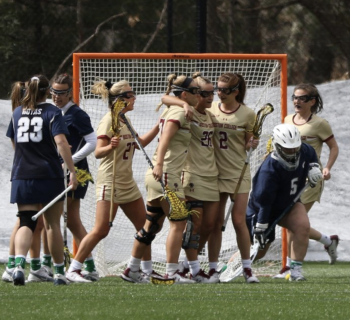 BC’s top line of Mattila, Cotton, and Hutsko had previously accounted for 10 of the team's last 15 goals and 55% of the total offense in the last five games. Now, all the momentum transferred to BC heading into the third with the Eagles looking to put down their division rivals in the series opener. In the third period, the Eagles padded their lead with goals from freshmen Oliver Wahlstrom and Marc McLaughlin. McLaughlin picked up the first goal of his collegiate hockey career on a redirection from Michael Kim’s initial shot. The Terriers had great chances all throughout the period, but Woll, who notched a season-high 38 saves, kept up his stellar play as the Eagles rode their offensive and defensive prowess to victory with a 4-1 win. The Eagles are now 13-4-2 in Agganis Arena, seemingly unfazed by playing in a hostile environment. On Saturday night, it was time for the Terriers to venture across Comm Ave to Chestnut Hill, where the Eagles sought to sweep the season series Saturday night in Kelley Rink. The Eagles had a completely different start to the game from Friday night, maintaining offensive possession from the very beginning. Both teams displayed great defense, blocking passing lanes and forcing pucks out of the zone. Yet, BC was getting almost all the looks offensively; in the first period, the Eagles led the way with 16 shots to BU’s 10. The Eagles picked up their first man-advantage of the game in the second period after a slashing penalty on BU’s Farabee, but couldn’t convert. The powerplay line of Wahlstrom, McPhee, and Räsänen didn’t get anything going against the strong BU penalty killing unit. Back to even strength, the Eagles started to get going offensively. Julius Mattila had a golden opportunity to score on the breakaway, but was denied on a sliding save by Oettinger. BC’s Christopher Brown and Luke McInnis also came away empty-handed on some chances halfway through the second. Cotton almost scored after Farabee slipped and turned the puck over right in front of the net, but Cotton’s shot sailed right over the crossbar for arguably BC’s best scoring opportunity of the game. BC didn’t help themselves with two penalties from Michael Karow in the second period. Luckily, Woll carried his incredible play on Friday into Saturday’s game and remained steady in net, despite seeing just fifteen shots to this point. The Eagles and Terriers headed into the locker room still locked at zero at the end of the second period. The third period was a wild one. BU’s Patrick Curry almost scored on a 3-on-2 breakaway with his shot ringing off the pipe. On another possession, Gabriel Chabot came close on a wrist shot that sailed wide. BU had five shots early in the third period after having just five in total in the second period. With three minutes to go in the period, BC’s Graham McPhee headed to the box after a hitting from behind minor penalty. In a crucial penalty kill for the Eagles, they stepped up and gave BU absolutely no chance to score on the power play; BC ended up clearing the puck three times with no shots from BU. The game would head into overtime–the 43rd overtime in the history of the series. In OT, neither team could muster anything on offense due to great goaltending from both Woll and Oettinger. BU’s best chance in OT came in the last seconds on a breakaway for Farabee. The Battle of Comm Ave would end with a tie, 0-0. For the fans, this is a disappointing result, but both coaches walked away with a lot of positives. BC’s head coach Jerry York was proud of the team for back-to-back solid efforts, especially lauding the play of both goalies, calling them “two of the premier goaltenders in the country.” Both were members of the 2017 U.S. National Team that won a gold medal in World Juniors play. Oettinger had one of the best games of his career, recording 42 saves and securing his tenth shutout. Oettinger, a member of the Dallas Stars system, has a 3.43 goals against average and a .894 save percentage so far this season. The crowds for both games were fantastic. After recent outside criticism about a lack of attendance from BC students, Conte was rocking on Saturday night. Historically, BU leads the series with a record of 135-125-19. This is the first scoreless tie in the history between the two programs. All in all, the weekend was quite successful for the Eagles. 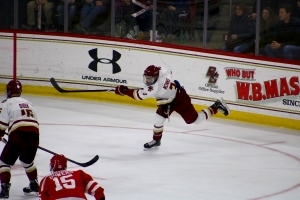 BC walked away with 3 points from the two games and moved into a tie for fourth place in the Hockey East conference. The Eagles will travel to Storrs to face UConn on Thursday at 7 p.m., then come back to Chestnut Hill on Friday at 7 p.m. for another home-and-away series against the Hockey East rival.